Every movie première attracts an eager audience, and nobody needed a red carpet to work out who were the stars of the show at the MERIT Vanguard programme’s World Mental Health Day event on 10 October. 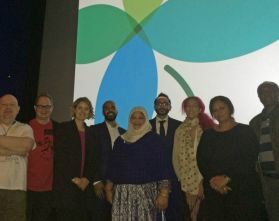 The programme held the first screening of five Mental Health First Aid (MHFA) training videos which were made recently in partnership with Fresh@CU, part of Coventry University. Two more videos are currently being edited, bringing the total to seven. Each film lasts around eight minutes and features a service user from the West Midlands, discussing their personal journey in their own words. Service users who feature in the training videos watch themselves on the big screen, alongside MHFA instructors from trusts across the MERIT Vanguard partnership. There are over a dozen qualified MHFA trainers across the trusts in the West Midlands, from all sections of our community, and some of them were present to view the new training materials and receive certificates to mark their achievement. The two-day MHFA course equips people in the community with the skills they need to be able to help keep someone safe until they can receive more qualified help. The modules look at different forms of mental health problems, and how a person may act or respond. The MERIT Vanguard programme will now ask Mental Health First Aid England to consider accrediting the locally-made films for use in training courses nationwide.